Why Buffets and Culture are So Dangerous; how do you cope during corset waist training? In my three-month coaching program, I strongly recommend that my students avoid buffets. But I never really understood the full panoply of reasons that we pig out at buffets, until I read Bee Wilson’s new book, First Bite. I highly recommend it to you, especially her informative chapter on hunger. For waist trainees, hunger is much diminished for many reasons by wearing a corset when you eat, and moreso, by dedicated corset waist training. I’ll be attending Wilson’s book signing at 6:30 pm this Jan. 21 in San Francisco’s Omnivore book store on Cesar Chavez Street in the Mission District, and if you can make it, you might want to join me. Buffets in this blog mean and include buffets laid out family-style at home, as well as in those ubiquitous buffet restaurants you can find in many major shopping centers and strip malls, especially in Chinese buffets. I know about both. To celebrate my mom-in-law’s birthday, this past Saturday we ate out in a Chinese buffet in Concord, one that we have attended a number of time over the past 14 years. She’s a delightful little “bit” of a thing, about 100 pounds “soaking wet” as my dad used to say. It’s not my intention to criticize or mislead anyone into thinking I’ve studied the science of nutrition much less know much about sound child-rearing practices. I do, however, read a lot in nutrition, and I think carefully about my personal observations and family experiences so that I learn how to better protect and preserve my own food health and the health of my life partner, Ron. Ron and his youngest sister are Chinese-American. Both of his parents and his older brother are from China, but his brother was raised from the age of nine in the Bay Area when his family immigrated here. As a family they never eat out anywhere but in Chinese restaurants preferred by his parents and our aunt, mainly in buffets. I believe those food and restaurant preferences to be in part a result not only of their tastes for familiar foods, but also a part of their culture of conserving their financial resources and investing wisely. Chinese buffets are amazingly inexpensive compared to some other buffets. Conserving finances is a value I also appreciate and know something about from my Scotch-heritage mom. Ron had never heard about that culture’s similar values until I told him about the phrase “Being Scotch”, meaning, being parsimonious or even stingy when it comes to spending money. But the Scotch-Germans eat quite differently from the Chinese, as I’ll describe below. We’ve all seen the phenomenon in operation at buffets. Some fill their plate up high with the main courses and eat an entire plate, then go back to fill up another clean plate with desserts. One of each thing never seems enough. I remember observing that phenomenon at my favorite wedding reception of all time for a BFF. To save on wedding expenses, the couple asked invitees to bring one dish that we made, to put together on the reception buffet table. Of course we all knocked ourselves out to bring our best. The array was stunning and the favors were superb. I watched the man and woman sitting at the next table over, do just what I describe above for Chinese buffets. I wish I had taken a surreptitious picture of their plates; it was horrifying! I know that since I changed my eating habits last summer to avoid refined sugar and cut way, way back on processed foods, I just don’t relish the thought of attending those Chinese buffets. Perhaps even moreso I dread the temptations of my Chinese family’s family-style buffets that are far more common, as we don’t eat out all that often. But over time I’ve learned to manage the temptations a bit better, which is subject for another blog. I was amazed when I first met my partner fourteen years ago and then met his family and attended my first at-home gathering for dinner. My own family is from North-Western Europe. My dad was of Irish heritage and my mom as said, was of Scotch-German background (to be sure, both many generations removed). We ate in a typical fashion for that region: one meat, one vegetable, and one starch served on each dinner plate, sometimes a small side plate of salad, and often a small dessert served immediately after dinner before we got up from the table, like a tiny-sized cookie or two, or small slice of pie. My partner’s family eats in what he says is a typical Chinese cultural style: each family member brings two or three dishes to the party. 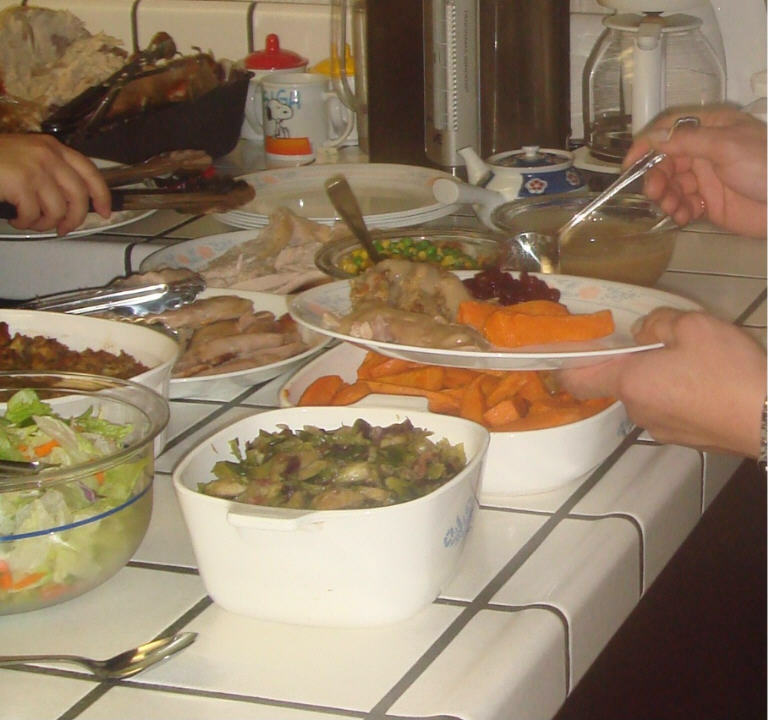 The food is laid out on the counter in heaping serving plates or bowls. Buffets invariably feature three to four meats and three to four vegetables. 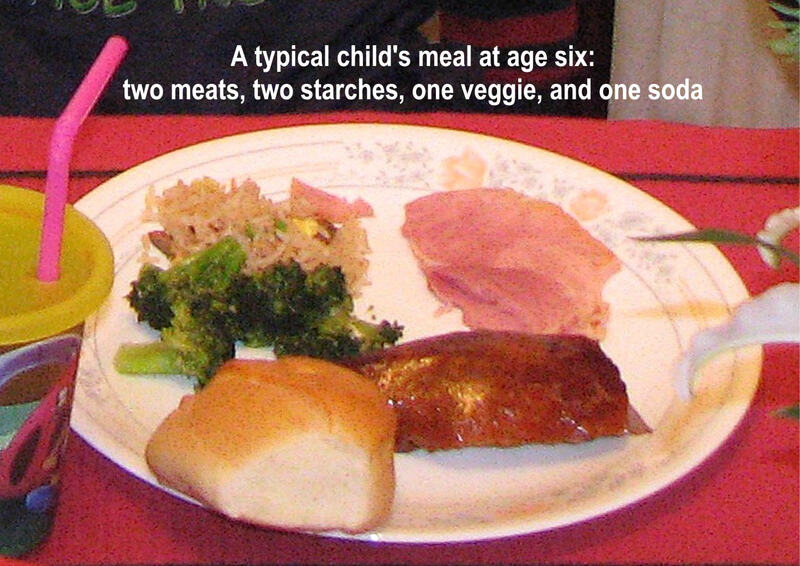 They also typically feature two starches (noodles and mashed potatoes), two salads, and two bread choices to boot. Those are the minimums; sometimes there is even more. In 2011 I even witnessed them offering two birthday cakes at one time, because two of our family members have birthdays occurring in the same month. Gratefully, that only has happened once. I fully admit at that time when I was eating sugar, I was most delighted by this happy abundance! Part of the danger of this practice is its effect on children being raised in the home. 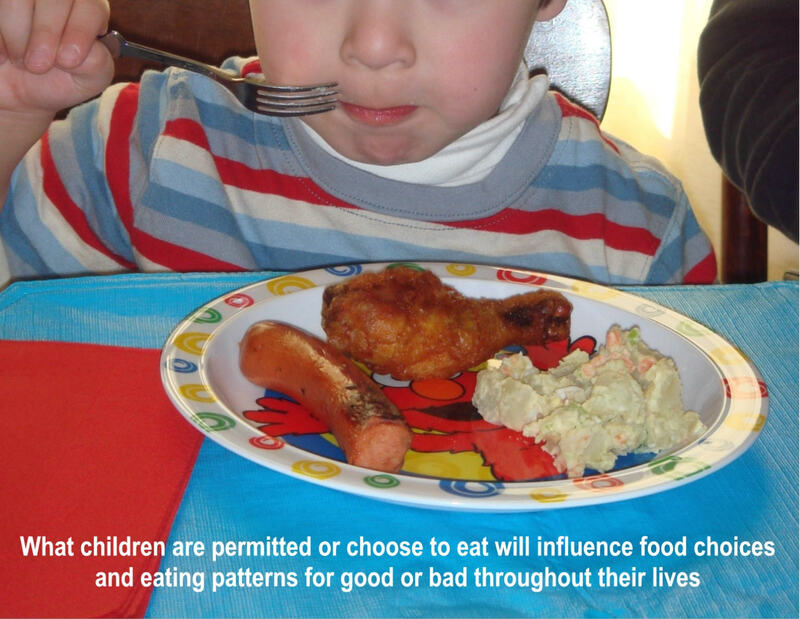 Parents model eating behavior; it’s that simple. Wilson agrees. That’s the thesis of her book First Bite, that how we eat as adults is influenced heavily by our upbringing. Her good news is that we can change those habits, preferences and our tastes even if it takes some attention and effort. In general, I was simply gobsmacked when I first saw this amazing array of food. I first thought it was an exception to the rule, like for most Thanksgiving or Christmas feasts, but no, these types of incredible buffets are standard fare for family dinners. It’s not too surprising that at these family dinners just like at Chinese buffet restaurants, I observe his family members over eating every single time. Each person fills his or her dinner plate with savory foods, and everyone, even Ron’s diminutive father and mother, go back for seconds. Sometimes I see that happen with my nephew. Often that is true for desserts as well, when the time comes. Gratefully, I have avoided picking up that practice, and I rarely see my brother-in-law do that. He’s of Scandanavian descent. Just as gratefully, Ron has begun to recognize the dangers of this family tradition, habit and practice, and accordingly, he now makes healthier choices for himself, including joining me last summer in cutting way back on refined sugar and processed foods. To a person with the exception now of Ron, his family members over stuff themselves. Even his diabetic brother accepts a huge piece of sugar-iced birthday cake, but why? It must be the variety, and seeing that variety stretched out on the full kitchen counter is hard to resist. Reason does not prevail on such occasions, with the exception that Ron’s brother and his partner lately have been bringing a roasted root vegetable medly dish for family dinners, a dish that is not only delicious but nutritious as well. And then they pig out on over-sized portions of that and other choices, as is normal. I’m sure that tummies don’t feel all that good a half-hour after they finish eating. Often even if I do my best not to overfill my plate, I overeat and feel the same. The family has to wait two to three hours for dessert. My family used to serve it right after the meal, but comparatively, we had not eaten all that much to begin with. With Ron’s family we scatter after dinner into smaller groups to watch television, read a book, or chat. Some go on a short walk, which is good. No one can bear the thought of eating dessert right after such a sumptuous meal. Thus, family dinners on a weekend day end up being a real event, taking an entire afternoon into the night, and nothing else can be planned. To me, these buffets appear to encourage compulsive over eating. Ron says that it might be because his parents grew up in southern China and experienced in their early lives, a very dire food situation. His mom and dad sometimes had nothing to eat but a few grains of rice in their bowl. In America we know that as the “depression mentality.” My mom went thru the Great Depression, but she fared better. Her dad was a train engineer for the Norfolk and Western, and always had a steady blue collar job. He was able to provide regularly for his family, so mom was extremely lucky. She did tell the tale of how she and her two brothers were permitted to take as much from each serving bowls on the table as she wanted, but with one provision: she had to eat every single bite on her plate. 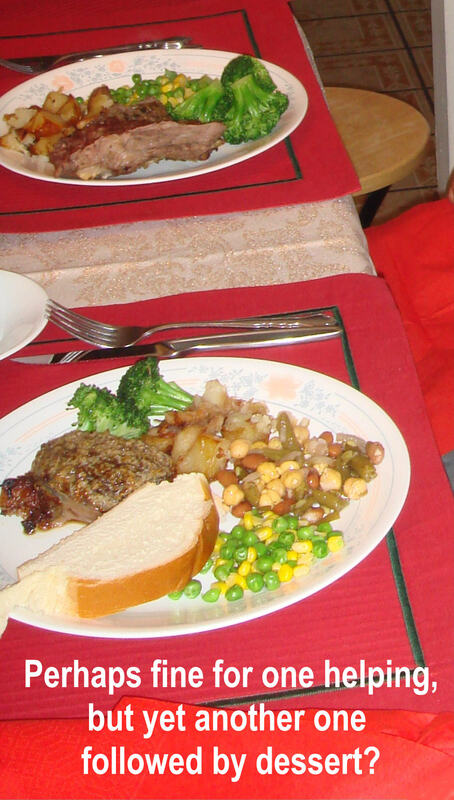 She also told of sometimes waiting til her parents weren’t looking and if she had taken too much, she would let her Collie “Bill” sidle up to the table then she would surreptitiously feed him the last bits on her plate. I guess you could say it was a “win-win” situation for every one involved even if the parents were being kept in the dark! I also remembered that even if my mom restrained the quantity offered for our daily meals, my mom would over-offer food at her famously famous dinners for guests, or tea parties for her girl friends and my high school friends as well. There, it seemed de rigueur to show abundance and generosity especially with fatty and sugary foods, and accordingly, over feed her guests in the style of typical Chinese dinners. When I lived at home I was always delighted when those somewhat rare occasions came along, although I’m not so pleased these days of trying to do better for my waistline and long-term health. I’m curious about how others have dealt with buffets and huge family dinners, be they for special holidays or for every family gathering? For certain, it takes a huge amount of will power and convincing oneself before the buffet, that normal tendencies to over indulge are human, but truly detrimental to our health, and giving in to our baser instincts runs counter to our goals of better health, especially if we are pursuing corset waist training as one strategy for shaping up.